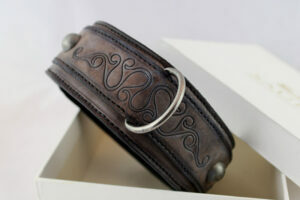 Merovingian handmade leather dog collar fits medium sized dogs such as Doberman, Shar-pei, Golden retriever, Boxer, Malinois, Weimaraner, but other breeds as well as mixed breeds having neck widths 17-21 inches can wear it too. 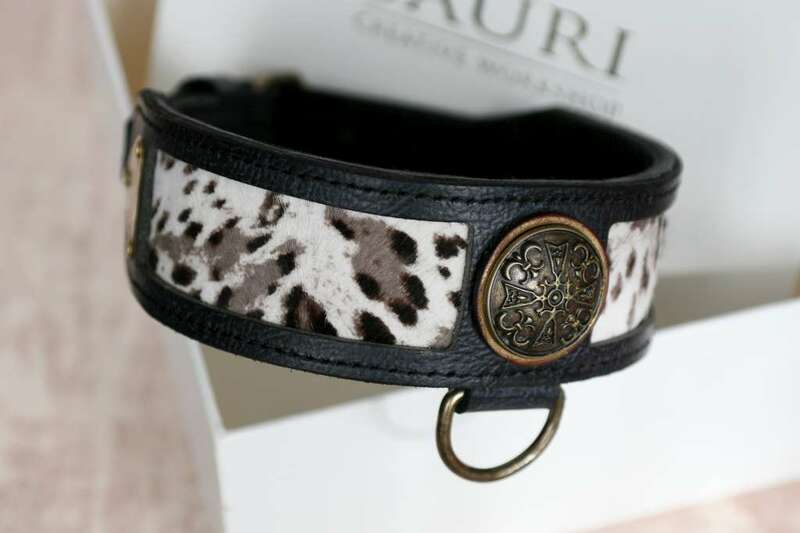 SKU: UC055 Categories: Featured, Leather Dog Collars Tags: Dog walking, Fancy leather, Medium sized dogs, Ornamented, Standard collar Brand: Workshop Sauri | Leather dog collars. 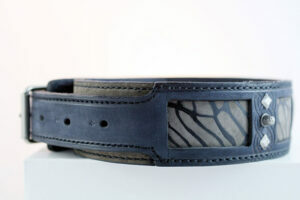 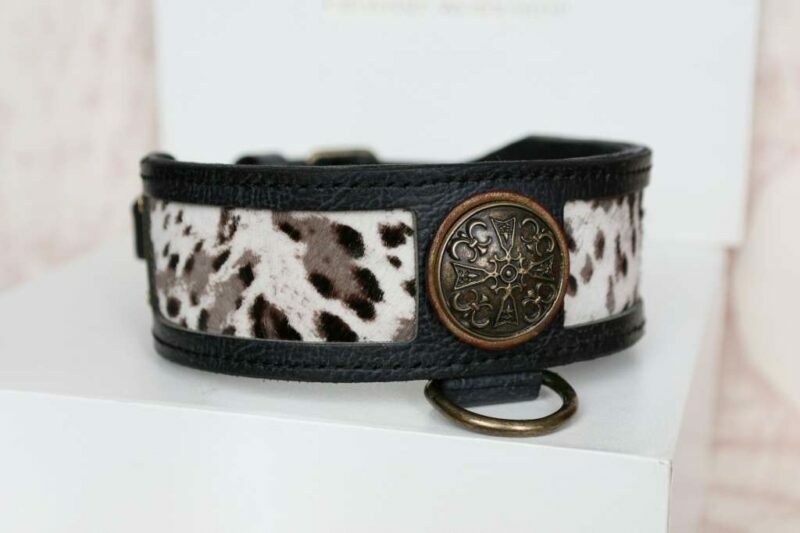 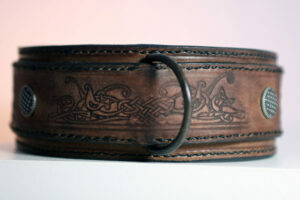 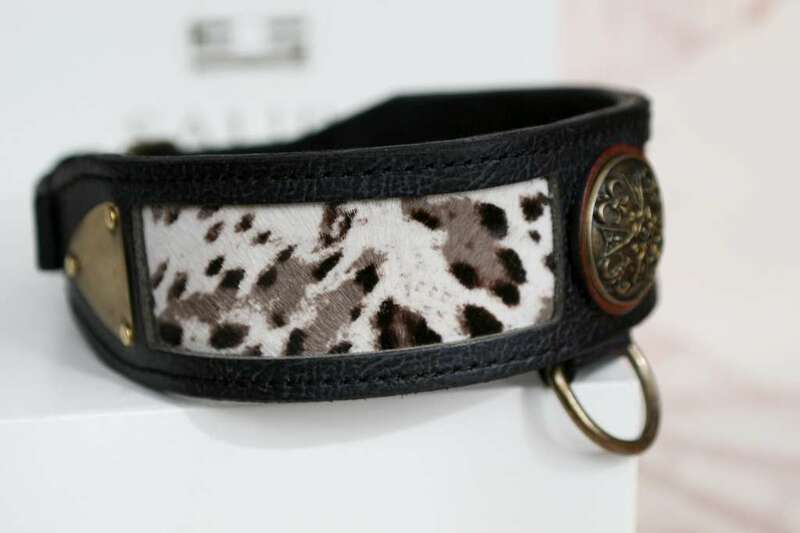 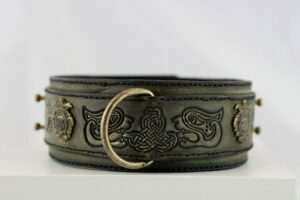 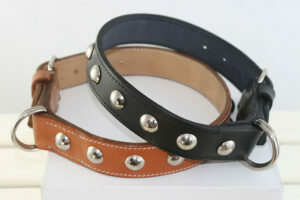 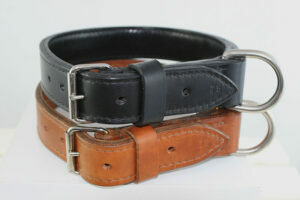 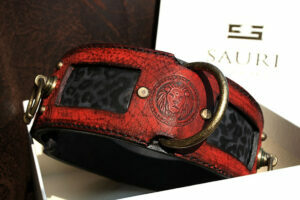 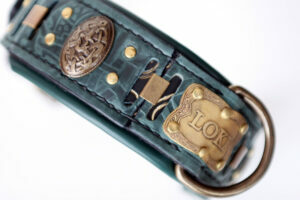 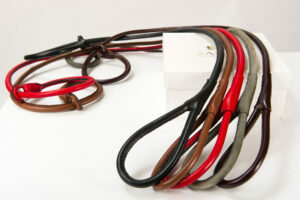 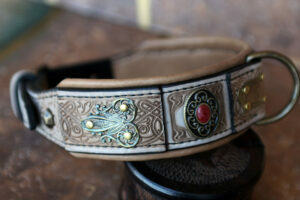 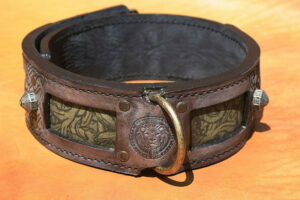 This handmade leather dog collar consists of black full grain overlying leather, real fur and nubuck background leather. 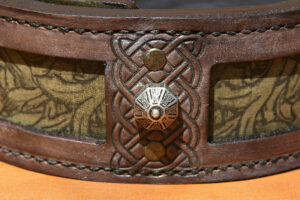 It is elegantly looking with a few eye-catching ornaments: two side brass plates and a central Merovingian cross. 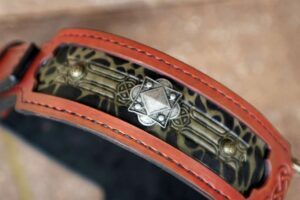 Merovingian handmade leather dog collar fits medium sized dogs such as Doberman, Shar-pei, Golden retriever, Boxer, Malinois, Weimeraner, but other breeds as well as mixbreeds having neck widths 17-21 inches can wear it too. 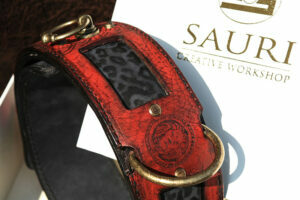 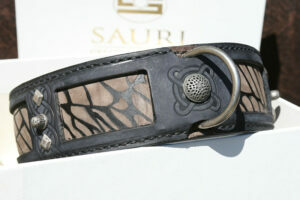 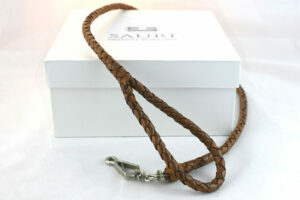 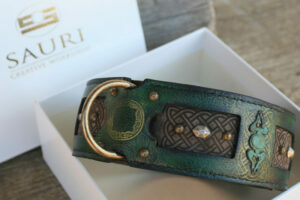 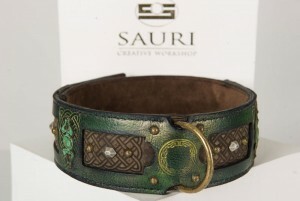 Workshop Sauri handmade leather dog collars are compact – firm but not stiff. 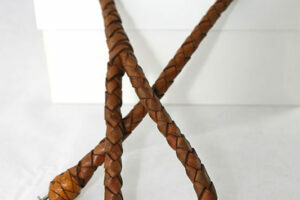 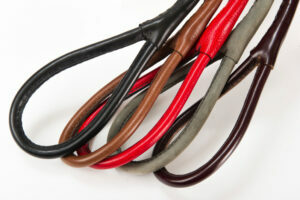 Leather is resistant to cracking and stretching and will serve a long time of day-to-day use. 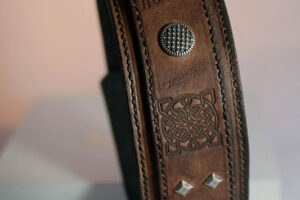 To avoid riveting on the collar’s inner side we hand stitch the buckle part. 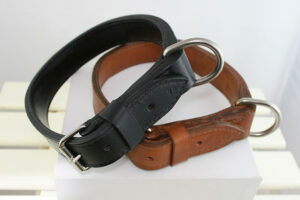 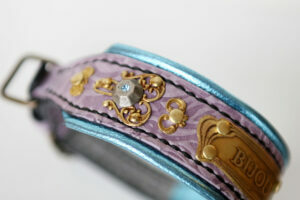 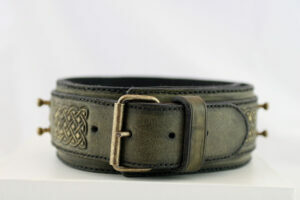 Leather edges were hand skived, polished and painted for more elegant looks and suppler feel around the neck. 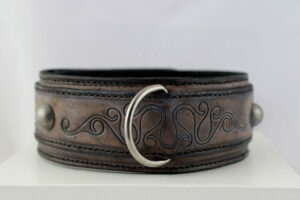 Collar’s tapering ends provide much comfort under the chin when dog is wearing it. 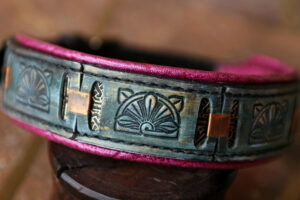 Solid steel brass patina hardware was used. 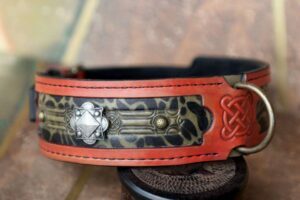 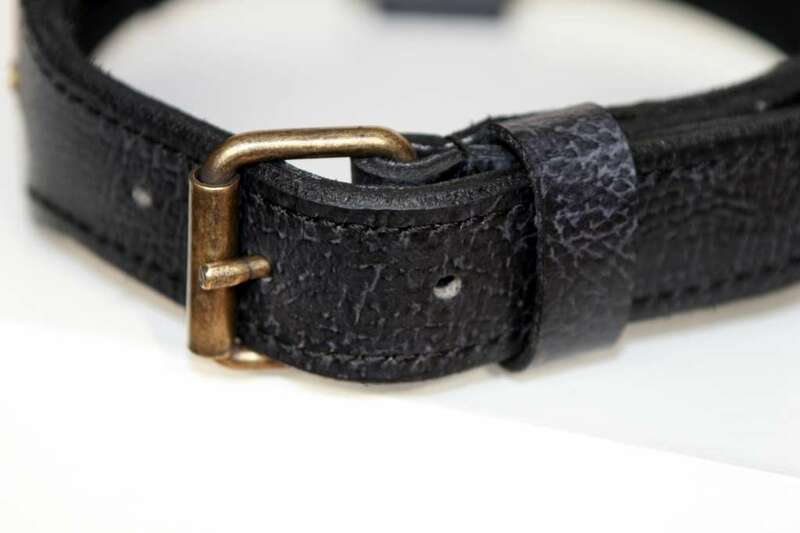 If you have any question about Merovingian handmade leather dog collar or need advice on choosing the right collar for your dog, contact us – we are here to help.